The Eagles perform at Citizens Bank Park in Philadelphia on July 28, 2018. In Don Henley's "The Boys of Summer," the ruminative vocalist and cool cofounder of the quintessential dark Californian band the Eagles sang of a man's aging process, reminiscing about friends lost and left behind. Henley's great loss, and that of Eagles Joe Walsh and Timothy B. Schmit, was the death of bandmate Glenn Frey in 2016, leaving a creative hole akin to the Rolling Stones' Jagger losing Richards. "I don't see how we could go out and play without the guy who started the band," Henley told the Washington Post in 2016. 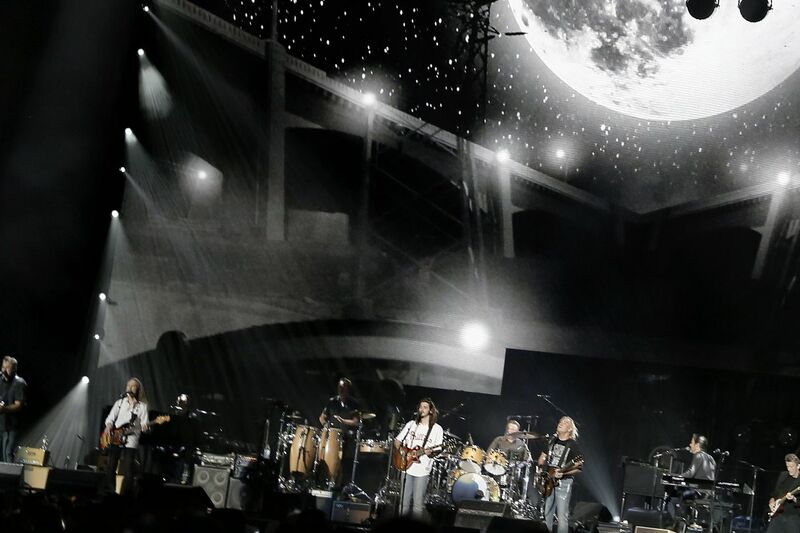 Two summers later, the Eagles have seemingly healed and filled that void, bringing Frey's singing son Deacon into the fold — along with smoldering country-blues guitarist Vince Gill — and touring with genial, melodious James Taylor. Such California melancholy country/rock/soul and blissful, mellow pop was the perfect soundtrack to a breezy Saturday night at Citizens Bank Park. The Eagles have turned to country-blues guitarist Vince Gill to help fill the void left by the death of founder Glenn Frey. Opening with the opulent vocal harmonies of "Seven Bridges Road" might have seemed odd, as it came from a band outsider (outlaw composer Steve Young). But Saturday's finest moments radiated the plight of the insular outsider ("New Kid in Town" and dusky "Desperado"), and from songwriters J.D. Souther ("How Long"), Tom Waits (a noirish "Ol' 55"), and Jackson Browne ("Take It Easy," cowritten with the late Frey). Despite the inclusion (infusion?) of young Frey and Gill ("the new guy at 61," he announced), much was the same about the Eagles' live sound. Their harmonies were so clean you could operate on them. At 71, Henley's clarion rasp and cutting falsetto on groovers like "One of These Nights" sounded like that of a 20-year-old. Schmit's high voice on ballads like "I Can't Tell You Why" made him sound like a baby Barry Gibb (Schmit is also pop's most underrated bassist, with a signature fluidity that gives the Eagles their soulful heft). The group has been criticized for its live, rote, note-by-note perfection, but precision like that was to be applauded. Frey — wearing a Phillies shirt, cheering Philadelphia's Eagles for the team's Super Bowl victory — looked exactly like his old man on the cover of 1973's Desperado. Deacon's plaintive voice sounded like pop's as he warbled through the country-like "Take it Easy" and "Peaceful Easy Feeling." The surprise was how many Glenn Frey songs Gill sang (they were pals for 35 years), and how soulful and comfortable he sounded coursing through the louche "Tequila Sunrise" and "Lyin' Eyes." Deacon Frey, a son of the late Glenn Frey, is introduced at the beginning of the Eagles concert at Citizens Bank Park. Where things were different was how expansive several of the Eagles' hits have become, such as the diabolical Morricone-esque take on "Hotel California." When it came to loosening rules, blame Walsh and country-jazz guitarist Steuart Smith for giving "Witchy Woman" its bluesy rattlesnake rumble, crafting a series of unbound, expressive solos, and adding massive doses of dusty funk to the proceedings. All that was topped with a surprising number of aggressive solo Walsh numbers ("Life's Been Good"), slide guitar, and talking, box-driven tracks from his James Gang days ("Funk #49"), and his disco-sounding Eagles hit, "In the City." It's weird to think the future of the Eagles could be in the hands of Walsh and Gill doing more of their thing within the legendary band's framework (Gill performed his own "Don't Let Our Love Start Slippin' Away"), but, to partially quote Henley at the show's start, "we'll keep playing these touchstones, because things are changing fast." While a vast understatement to the Eagles' big show, Taylor offered a lovely, lively and supple opening set. James Taylor and his All-Star Band proved a sweet, smooth opening act. Filled with his unmistakably understated and vibratoless crooning on smartly literate and sweet ballads such as "Sweet Baby James," "Fire and Rain," and the quaintly tender "Carolina on My Mind," Taylor turned a huge stadium into a back porch on a quiet morning. Yet, he and his large ensemble didn't shy away from grooving, horny R&B as they tackled the dirty blues of "Steamroller" and the playful "Mexico." For a sound so intimate, Taylor's rich, gentlemanly tenor, his kind, cool demeanor, and the curvaceous chord changes of his memorably melodious songs filled up every inch of Citizens Bank Park. It was an elegant start to a perfect evening.